Several hundred would-be Mars colonists have just had their hopes and dreams dashed. 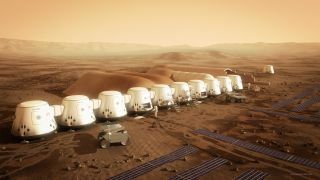 The Netherlands-based nonprofit Mars One, which aims to establish a Red Planet settlement beginning in 2025, announced Monday (May 5) that it had sliced its pool of potential colonists from 1,058 down to 705. The remaining astronaut candidates now advance to an interview round with Mars One's selection committee. Mars One plans to launch its first crew of four Mars colonists in 2024, with touchdown on the Red Planet coming in 2025. Additional crews will blast off in two-year increments thereafter, gradually building up the off-world settlement. At the moment, there are no plans to bring these pioneers back to Earth. The organization will mount several unmanned Mars missions in the next decade to demonstrate technologies and prepare for the arrival of people. For example, it aims to launch a robotic lander and orbiter in 2018, a scouting rover in 2020 and six cargo missions in 2022. Mars One plans to pay for all this by organizing a global media event around the Mars colonization effort, from astronaut selection through the settlers' time on the Red Planet. It's already negotiating with media companies about showing Round 2 of the selection process on TV, representatives said. "Once the television deal is finalized and the interviews begin, the stories of the 705 aspiring Martians will be shared with the world," Mars One said in a press release Monday. More than 200,000 people applied to become Mars One astronauts. In December, the organization slashed this pool down to 1,058 candidates. The interview round will slash the ranks further, from 705 potential settlers down to just a handful — enough to staff "several international teams consisting of two women and two men," Mars One's press release states. These teams will train full-time for their possible Mars mission. "Whole teams and individuals might be selected out during training when they prove not to be suitable for the mission," Mars One wrote in the press release. "Mars One will repeat the selection process regularly to train additional teams to replace eliminated teams and crews of settlers that have successfully left Earth to live on Mars."